Zimbra.org: How to Convert Microsoft Outlook MSG to Zimbra Desktop? How to Convert Microsoft Outlook MSG to Zimbra Desktop? When we talk about Microsoft Outlook and Zimbra Desktop separately, both applications are different from each other, both are having different file formats to save their data. On one side we have Microsoft Outlook which is most preferable and wanted email application which comes with MS Office package. Microsoft Outlook individual mails save in .msg format. And on other hand we have Zimbra Desktop which only allows to import TGZ file. So if you want to Export Outlook to Zimbra then simply you have to convert Outlook Mails to Zimbra Desktop supported TGZ format. Follow the mention steps and convert Outlook to Zimbra Desktop. When you drag and drop messages from Microsoft Outlook, all the extracted messages will create in .MSG format. Select all the mails using the process of Ctrl + A, and simply drag all the messages and drop them to desired location. Save all the extracted Outlook MSG file. 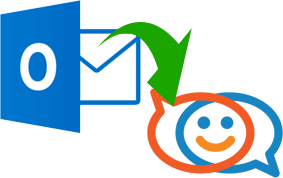 First step to convert Outlook to Zimbra - once you extract Outlook Mails in MSG format, Use the MSG to EML Converter software that will help you to convert Outlook MSG files to EML format. You can use this software to convert both UNICODE and ANSI MSG files. Software convert MSG file with attachments into EML format. Second step to convert Outlook to Zimbra - Once you convert MSG Mails to EML format, use EML to Zimbra Converter software to migrate EML emails into Zimbra Desktop. Finally after this conversion you will be able to access Outlook to Zimbra desktop.